As a plus sized woman, finding clothes that fit and look good can be difficult. Add in the hassle factor of finding the perfect pair of jeans, and you may want to give up before you even start. It doesn’t have to be that way, though. My lifestyle lends itself to wearing a lot of jeans and denim pants in general. But, I don’t always want that boring ol’ plain jeans look. On the flip side, I also don’t always want a distressed boyfriend jean or jewels all over my back pockets. 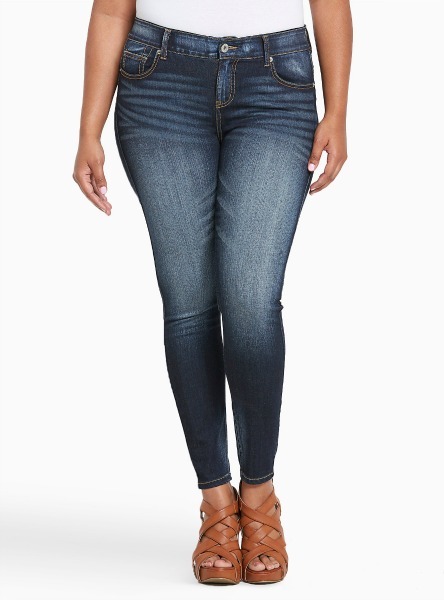 These are my favorite places to find plus sized jeans. One of my favorite places to find plus sized jeans is Torrid. Torrid has great styles that truly fit, and were designed for, the plus sized figure. Their styles are totally on trend, and come in great colors and fabrics. They don’t get stretched out and saggy looking, and they don’t have that mom jeans look or feel to them. Torrid also offers lots of different lengths, from extra short to extra tall. Read the reviews to help you find your perfect size, as they’re really helpful and generally spot on. I have some real love for Macy’s and their plus sized selections. Some real frustrations, too, but a lot of like. Personally, I like the Charter Club line of jeans that they carry. It’s the Macy’s house brand, and they’re cut well for my figure. They last a long time, and they’re just good basic jeans. You don’t have to worry about a weird fit or all the pocket detailing. And, you can often find them on sale. They do offer current denim trends from brands like Lucky (shown) Rachel Roy, and SLINK, too. I know what you’re thinking “Ummm…those are mom jeans…” They can be. Lee Jeans also has some great cuts and style features that are transitioning them out of the Mom Jean category and into the good basic denim class. New cuts, new colors and finishes on the denim, modern trends. Another plus is that Lee keeps their sizing consistent across the board. I pretty much know that I can go into any store and pick up a certain size, and they’re going to fit. This has come in handy when I forgot to pack pants for a trip. Hey, it happens! Kohls isn’t my most favorite place to find plus sized jeans, but they do have a great selection. They carry Lee Jeans, but also Gloria Vanderbilt, Rock and Republic, Chaps, and several house brands like J.Lo. If you’re looking for colored denim, Kohl’s usually has a wide variety in the Gloria Vanderbilt line, and they fit pretty well. Rock and Republic and J.Lo have more modern trends, and Chaps and Lee keep it classic. They even carry skinny jeans that aren’t jeggings. Couple that with their sales and Kohl’s Cash, and you can pick up some new pants at a pretty reasonable price. One caveat – you need to try everything on. 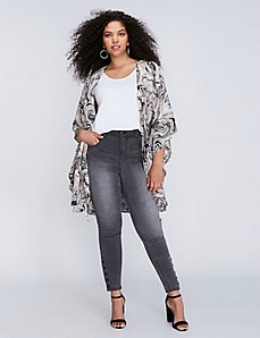 Lane Bryant has fabulous denim options in just about any style that you could want, and is another great place to find plus sized jeans. Straight leg, boot cut, boyfriend, distressed, jeggings, they have it all. Personally, I find that their pants run a little on the long side, but I also have short legs. Lane Bryant also offers everything from casual jeans for after work or the weekends to dressier denim that is totally office appropriate. Just because you wear plus sized clothes doesn’t mean you should forego a great pair of jeans. 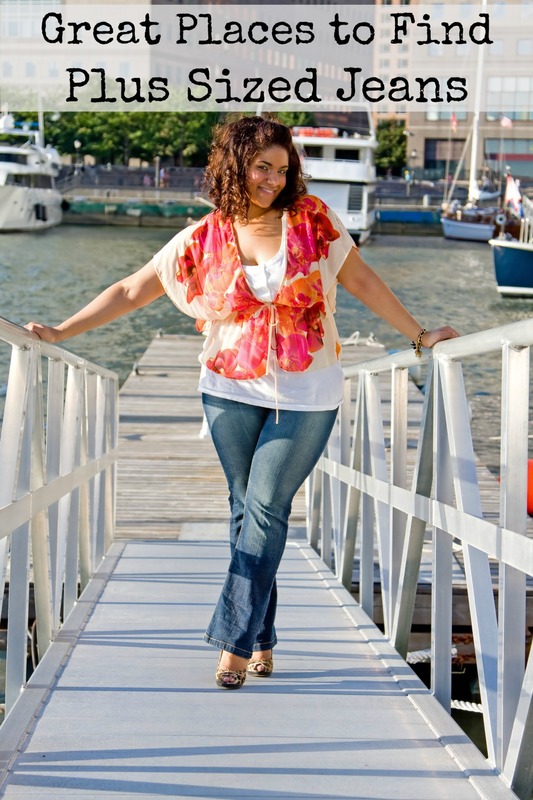 These are just a few of our favorite places to find plus sized jeans. What are your favorite places?